Of the official secret UFO documents that are now made available to the general public, the information from the Ecuadorian Government is the most significant and the most fascinating. South America is opening up to the idea of extra terrestrial beings and UFOs. Peppered with official interviews, fascinating UFO videos (even from official government sources), and objective insights, this video does away with conspiracy theories and delves into how a society adapts when a subject matter such as UFOs is not ridiculed but taken objectively. This video covers how Ecuador publicly discloses all official UFO reports. 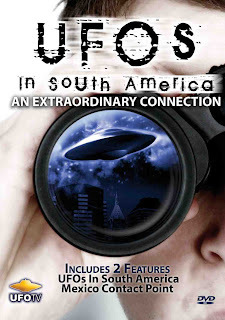 Littered with interviews and reports from government, military, and news sources, UFOs in South America shows how UFOs have transitioned from a taboo within official circles to a more or less serious and objective stance that UFOs might exist. This one is a real treat and recommended viewing. Aside from Ecuador, other countries such as Chile, Paraguay and France are also starting to open up its archives for public scrutiny. Scientists, researchers, military personnel and astronauts have been talking about UFOs for years. Recently some major governments have begun to make their files on UFOs public. Some people swear they've seen, photographed and filmed UFOs. But all too often, government documents remain secret. France, England and Ecuador have all recently released documents about UFO encounters to the public. Even the Vatican has recently stated that the existence of UFOs does not go against the Catholic faith. Of the secret documents that are now available to the general public, the information from the Ecuadorian Government is the most significant and the most fascinating. Get the facts about these amazing new discoveries as we investigate UFOs In South America and UFO / ET disclosure by governments around the world.